When I make cheese toast, I cover a slice of unbuttered wheat bread with cheese -- either American or Cheddar -- and toast it in the oven until the cheese melts. Sometimes, though, I want to serve cheese toast that's not so plain. When I do, I use a recipe I found in the newspaper almost 20 years ago. The recipe only uses four ingredients, but it elevates cheese toast from ordinary to extraordinary. To keep from making a mess on the cookie sheet when the toast bakes, I assemble the pieces on a cutting board or piece of wax paper. It's much easier to transfer the pieces than it is to scrub melted cheese off the cookie sheet! Rather than wheat bread, this cheese toast uses hoagie rolls. When I can't find these in the store, I substitute white deli rolls which are softer than hoagie rolls. 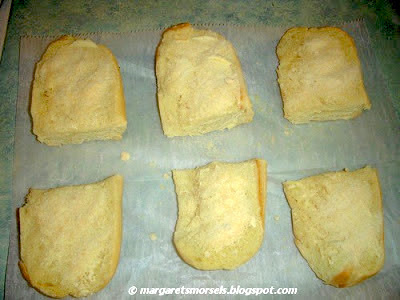 Whichever you use, start by slicing the rolls in half lengthwise. The recipe calls for the rolls to be buttered. If you want to save calories or make it a little healthier, do what I do and substitute margarine. 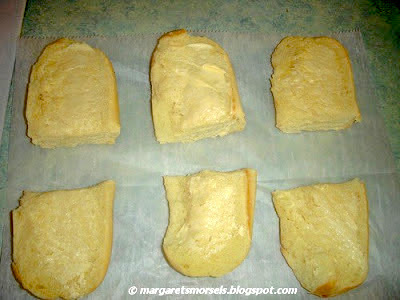 Once the butter or margarine has been added, slice the rolls in half -- diagonally or horizontally -- or leave them whole. Next comes the secret ingredient: Parmesan cheese. It gives the toast a pleasantly sharp taste. I don't have many recipes that call for Parmesan cheese so, rather than buy it fresh and not use it, I use canned Parmesan. However, freshly grated Parmesan cheese would make the toast even better! Cover each roll with a layer of Parmesan. Generously sprinkle finely shredded Colby Monterey Jack cheese over each roll. CoJack, as it's sometimes known, has a smooth mellow flavor that doesn't overpower the Parmesan. It melts easily and the combination of yellow and white cheese gives the toast a marbled effect. 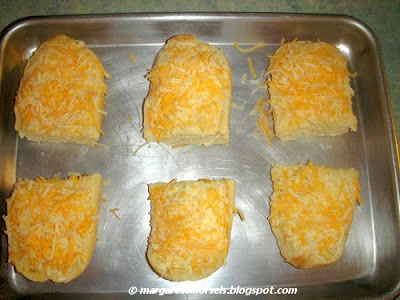 Transfer the rolls to a cookie sheet and bake or broil until the cheese is melted. This cheese toast is delicious with entrees such as Chicken Tender Salad, vegetable soup and pasta, but it's also good for breakfast. The next time someone asks what kind of toast you want, say cheese! Lightly spread butter on the cut sides of the rolls. 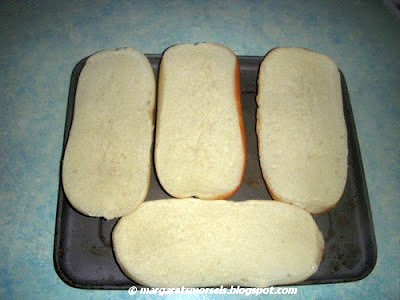 Cut the rolls diagonally or horizontally, if desired. Sprinkle grated Parmesan cheese over the butter. Top with Colby Monterey Jack cheese. Bake or broil until the cheese is melted.